One of the main problems that direct marketeers face is getting their mailings read. An e-mail in your inbox only has a sender address and a subject line to convince you. But a real mailing has other factors to convince you to open it. A phone company sent a promotional letter in the same envelope in which they usually sent out their bills. Bills are meant to be paid, so logically many people opened up the letter. Only to find a promotion. The campaign led to higher open rates, higher response rates and better results. At least in the short term. In the long run people were less likely to open the bills and much slower to pay them. 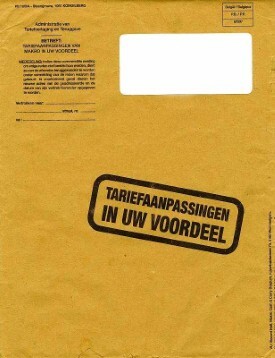 The death letter: In Belgium there is the tradition to write a letter to relatives and friends when there is a death in the family. These letters come in envelopes that all look very similar. With a possible death of someone close, these letters always get a lot of attention. A fitness chain decided to send out their mail campaign in these envelopes. 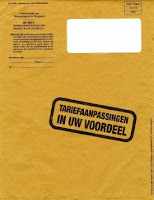 Retailer Makro Belgium send out their usual promotion folder in an envelope that is very similar to the one used by the Belgian tax department. They sent it out on the same day then the tax declarations were sent out. So people found two envelopes of the same kind in their mailbox. The example by the phone company violates the trust that the brand had gained with its customers. It is clearly a no-no. The other two examples use a different approach as they take advantage from a built-in routine with the user. A routine which is in no way associated with their brand and therefore won't have as big an impact as the promotion-in-billing-envelope. Although using the death letter as a promotional stunt shows bad taste in the approach, it sure got the mailings read and attracted extra publicity. Talking about Brazilian marketing, I remember a retailer promotion that was using the Globo vignette called Plantão Globo (which totally attracts the attention of everybody near any TV on Brazil). I didn't see the results, but I am almost sure that the promotion was a success. When does Globo usually use this kind of jingle? And are the people really paying attention to it, or is it like noise until the novela comes back on? They use it to report something really big (most time is some kind of catastrophe or when someone important die). Oh, sorry, I forgot to mention... People just stop whatever they are doing to pay attention on TV when they listen to that jingle. Seriously. Should Brazilian advertising be trusted?